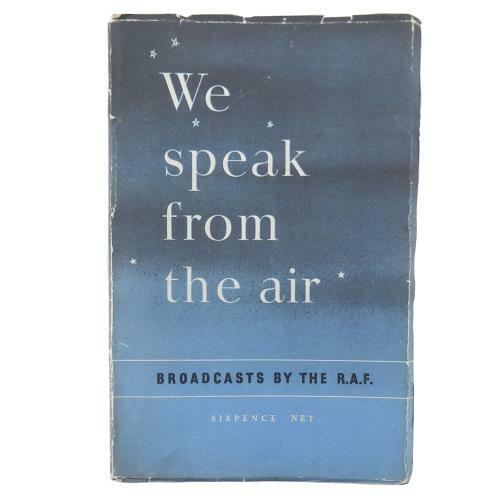 'We speak from the air - Broadcasts by the R.A.F.'. HMSO, P/b, 72p. 1st ediiton 1942. Men of the RAF describe their own experiences in their own words. Accounts of operations over Germany, France, Holland, Belgium and Italy etc. give the human stories behind the official communiques. One of the accounts is about a Havoc nightfighter and the crew's encounter with German aircraft and an airbase over/in France. This page is signed by Battle of Britain airgunner Sgt Albert Edward Gregory, 133005, 23 Squadron, who believes the story is about him and his pilot Wing Commander Hoare DSO, DFC. Gregory lived a stones throw away from our HQ until his death a few years ago. The cover is a little dog-eared around the edges but otherwise in good condition. Stock code P23206.